Nowadays, the word "cowboy" gets loosely thrown around to describe a person or persons who are outlaws or "shoot" from the hip and have no respect for anyone or anything. Lately, many people have referred to Presidents of the United States as "cowboys" attaching the meaning that many political pundits and Hollywood have so inappropriately labeled on an American icon. It is politically correct nowadays to label someone as a "cowboy" when you don't agree with their views. Unfortunately, most of these political pundits, Hollywood "stars" and many American people are unaware of the real meaning of cowboy and what cowboy means to those of us who are really "cowboys" at heart. What many of the people in American today forget is that Hollywood did produce some great movies that starred great cowboys such as Tom Mix, Roy Rogers, The Lone Ranger, John Wayne and probably the most famous of all Gene Autry. 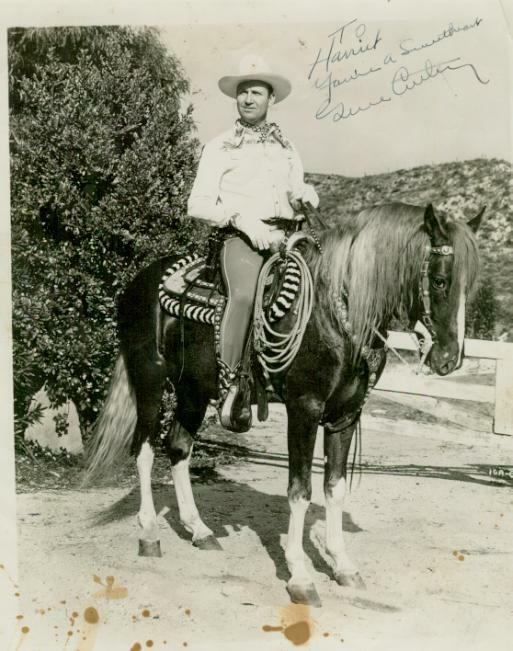 Gene Autry, who embodied the true meaning of cowboy, wrote "The Cowboy Code". This "Cowboy Code" how all cowboys and cowgirls should live their lives. So please read this code and remember that the next time you hear someone called a cowboy that they might not really know the true meaning of the word "COWBOY". Gene Autry's "The Cowboy Code"
1. The Cowboy must never shoot first, hit a smaller man or take an unfair advantage. 2. A Cowboy must never go back on his word, or a trust confided in him. 3. A Cowboy must always tell the truth. 4. A Cowboy must be gentle with children, the elderly and small animals. 5. A Cowboy must not adovcate or possess racially or religiously interolerant views and ideas. 6. A Cowboy must help people in distress. 7. A Cowboy must be a good worker. 8. A Cowboy must keep himself clean in thought, speech, action and personal habits. 9. A Cowboy must respect women, parents and his nations's views. Gene Autry & his horse, Champion. This was a signed picture given to Harriett Leuschner, Dogtown & Elizabeth's daughter, Harry & Bertha's Granddaughter. Dogtown and Gene Autry were friends for many years.